Here is a review of Eamonn Coghlan's recent autobiography published by Red Rock Press that appeared on the Armory website. The book is not widely available in the States, and I had to do a bit of digging to purchase a copy via the Irish publishing house's website (see below for the url). It's quite an interesting read, and I intend to devote greater space to it on this blog in the near future. But, for now, here is a small taste of what's in the book, thanks to the review below by P. W. Coogan. Just remember: Make one move, and one move only. Eamonn Coghlan’s life story published in Ireland and co-written with George Kimball, is pure in voice, joy and pain. Traveling to America via the yellow brick road that Villanova painted green, Coghlan arrived a dazed and innocent young man, standing at the door of Emerald City. Under the coaching of the bigger than life Jumbo Elliot and his assistant Jack Pyrah, Villanova became the first stop for the Celtic Invasion. Marcus O’Sullivan, Ron Delaney, Noel Carroll, Frank Murphy, Hartnett and Walsh, Reardon, John Joe Barry and Sonia O’Sullivan are just some of the Irish Wildcats that were nurtured by the Big V and adopted by those of Irish ancestry living throughout America. Villanova became to track what Notre Dame was to football. For the first time the Irish were invited to a foreign land, not to work coal mines, carry bricks, build railroads and fight other people’s wars, but to excel as scholar athletes. Some say Villanova was the first school to offer a Track scholarship to a foreign athlete. 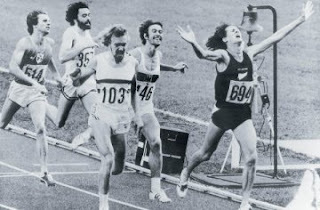 And in 1971, Coghlan would become the latest and maybe the most famous of the Wildcat runners. Eamonn Coghlan ran like Jimmy Cagney could dance. And, like Cagney, he had a twinkle in his eye and a boyish charm, that is ‘til you screwed with him on the turns, then you would see the other side of an Irish smile. Coghlan’s story is of a knock-kneed boy in corrective shoes, growing up in the tough Dublin of the 1950s. It is the tale of home, love and loyalty. He’s still married to his teen aged sweetheart, Yvonne. He reveals publicly for the first time his battle with depression, a condition brought on by constant injuries, lonely hotel rooms and unrealized dreams. As an elite runner the pressure is stressful, he tells us. He ran injured because when he gave his commitment, he stood by it and he could not permit himself to let down his fans. Coghlan’s world records in the indoor mile were topped with a 3:49.78 in 1983, at East Rutherford, NJ. 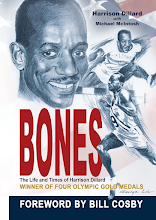 In 1987, he took the 2,000 meters in Inglewood, CA in the world record time of 4:54.7. In 1983, he won the 5,000 meter world championship in Helsinki, where upon hearing the news in Dublin, Bono of U2 stopped his concert to tell the Irish of Eamonn’s victory. His experiences at the Olympics were difficult, where his running for the gold brought hardship and despair. Running the Wanamaker mile at the Millrose Games is what gives legs to Eamonn Coghlan’s biography. Lacing up in NYC, Coghlan made everybody Irish in the smoke-filled, beer stained, popcorn smelling arena. Some say it was his size and stature that enabled him to take turns like a Masserati and gave him the edge over his competitors. Others say it was the benefit of the Villanova wooden track that each season was built outdoors by the runners and coaches. But more probably, it was his heart and the immeasurable scream of thousands of fans, vicariously pushing him to encompass their own dreams. If you say Wanamaker Mile, you think Eamonn Coghlan. It’s easy for us to see Eamonn Coghlan in his victories, but as is often with success, a runner’s pain and failure become invisible to a demanding public. Fortunately, the unlikely duo of acclaimed sports photographer Vic Sailor, and New York Athletic Club coach Paul Mascali, gave Eamonn the opportunity to go where no runner had gone before. On February 20, 1994, at the age of forty two, Coghlan took his revenge on time and history running the first sub-four minute Master’s Mile in the world record time of 3:58.15. Yeah, this is a book with ups and downs, but at the finish line you find Coughlin humble in his glory and, like a Jimmy Cagney movie, the reader feels part of the story.